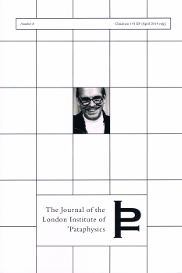 Special limited edition of the Journal of the London Institute of ‘Pataphysics, devoted to John White on his 78th birthday. Compiled and authored by Dave Smith, with an introduction by Gavin Bryars. Abundantly illustrated throughout. Additional input by Alastair Brotchie, Sally Child, Christopher Hobbs, John Lely, Antony Melville, Tanya Peixoto, and John White; and citations from the works of Virginia Anderson, Gavin Bryars, Michael Nyman, and Sarah Walker. The central work is Dave Smith’s catalogue raisonée of White’s music, which he has been collecting for decades. An essential for all John White fans. If you are interested in any of the above, e-mail questions**experimentalmusic.co.uk (for the **, substitute @) for postage costs or to notify us of your interest in pdf scores. Payment is made electronically by Paypal; please specify whether you would like a faster or slower delivery of your goods. Because of fluctuating exchange rates, do e-mail us for current prices in any other currency than UK sterling, although we do recommend sterling payments as the most economical way of paying.